For a variety of reasons that are really much less lucky or indicative of good planning than one might think, I managed to avoid having a huge portion of my retirement savings wiped out in this current downturn. For one thing, I rarely invest in single-issue securities, having little appetite for eggs when placed in a single basket. Just now, though, I'd like to gloat that the only single-issue stock currently in my portfolio just rose above the price I paid for it, commission and all, meaning I have an actual capital gain since buying the security in December 2007. Math is hard! Panic is fun! There are nine probable cases in Illinois, five of them in Chicago, the Illinois Department of Public Health reported Wednesday. An elementary school on the city’s North Side was shut down Wednesday after a child was diagnosed with what is believed to be swine flu. I don't have the exact numbers here, but I would imagine that more than one extra person will die and more than nine extra people will be injured because of people driving to the store to buy hand sanitizer than would otherwise be killed or injured without the extra driving. It's like the rise in traffic fatalities after 9/11, attributed to a mix of more driving and stress, both of which came at least partially from blind fear. Of course, it's possible that this flu could be the end of civilization. History suggests otherwise. But if it makes people feel better, by all means jump in your cars and buy toxic chemicals to rub on your hands in a futile effort to kill invisible agents of your...um...sneezing. Even better if you drive to the store without wearing a seatbelt. Legislators in Maine introduced a likely-to-pass bill this week. And to think, 300 years ago New England was a theocracy. Pat Toomey is of course the former president of the Club for Growth who planned to challenge Arlen Specter in the 2010 Pennsylvania Republican primary. Polls showed Toomey well ahead – not because he is so hugely popular in the state, but because the Pennsylvania GOP has shriveled to a small, ideologically intense core. Toomey now looks likely to gain the nomination he has sought – and then to be crushed by Specter or some other Democrat next November. ...I submit it is better for conservatives to have 60% sway within a majority party than to have 100% control of a minority party. And until and unless there is an honored place made in the Republican party for people who think like Arlen Specter, we will remain a minority party. By the way, I'd rather have an actual opposition party than what we have now. But this sort of thing has to happen about once in a generation. And 40 years from now, after the U.S. has swung farther left than most Americans can tolerate, it'll be our turn again. Parker's emergency bath, by the way, was successful. He is now allowed back in the house. Parker is asleep on my back porch and not allowed in the house because he decided, within 15 seconds of being off-leash at the park, that it would be fun to roll in a pile of gross, green, grass-covered, glistening, goose poop. We are now on our way to Petco for an emergency bath. 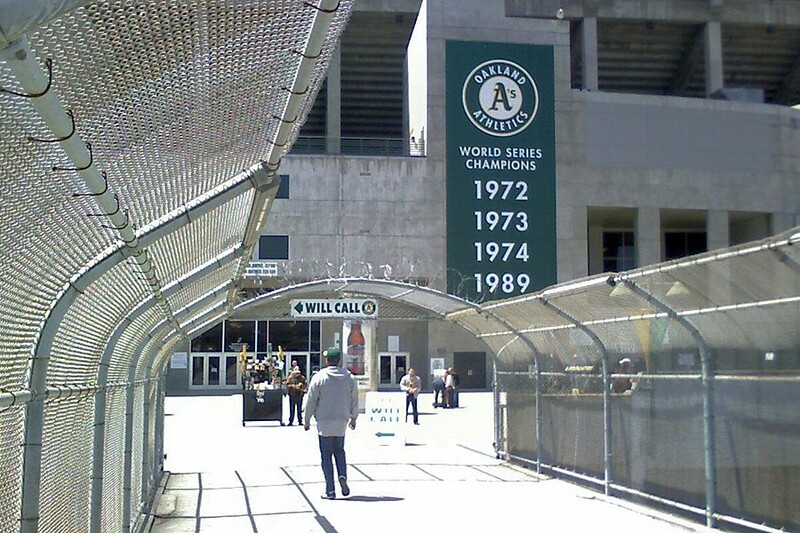 While in San Francisco for the weekend, I decided to continue the 30-Park Geas by seeing what the Oakland A's were up to. Last place, it turned out; but then, so were their opponents, the Tampa Bay Rays. Of course, Wrigley has fewer "World Champions" banners, too, but we'll skip that for now. The only bad parts, other than the park resembling in architecture and style (and, some might say, purpose) a medium-security prison: I forgot my camera, so I had to use my mobile phone to snap photos; and I couldn't find a score card. Oh well; still a fun game. Fifteen down, 17 to go. Arriving home this evening, after three days in San Francisco and frequent email checking while there, Outlook presented me with 295 unread messages (not counting the hundreds of messages in my spam filter). Of these, almost all were on my RSS reader—75 Facebook status updates, 50 posts from Andrew Sullivan, etc., etc. It's amazing how much better you can feel after hitting <Ctrl>+A, right-click, "Mark As Read". Problem: solved. I'm returning from San Francisco this afternoon, so tomorrow I'll have photos from Saturday's A's game and, if I get my very own YouTube account, a video of my sister's dog. I'll leave that for now. This morning, just a link: TheExpiredMeter.com, of interest to anyone who deals with the Chicago parking system. I found it because I discovered only yesterday that, sometime today, my car will get a parking ticket. I discovered this when my alderman's office sent a notice of street sweeping yesterday saying they'll be sweeping the block my car is on today. A little more notice might have helped. Welcome to summer in the city.